Aleo’s LVA™ Series offers an attractive, energy-saving solution to surface-mount or suspended-mount applications, suitable for damp/wet location. This LED Vapor Tight is designed for performance and longevity at an unbeatable value. 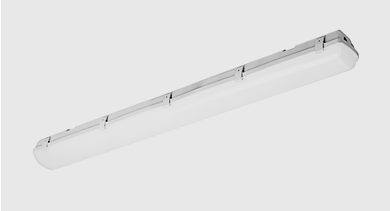 Manufactured for challenging situations where the fixture’s gasketed enclosure protects against dust, spray, humidity, and liquid. airports, cold storage, car wash, garden centers. solid security from challenging environments. comfort while maintaining high efficiency emission. UL8750 Class 2. Suitable for Wet Locations. DLC Premium. efficacy. Reliable driver features continuous dimming. Universal voltage (120-277V) for convenient installation.